This season was supposed to be different for the Cleveland Indians. Terry Francona is not Manny Acta. The manager and the front office are on the same page together. Or so we were told when Francona was hired last fall. Forget the left field platoon of Johnny Damon and Shelly Duncan. And the predominately left-handed hitting lineup. This year’s lineup is better. Don’t worry about the 5-24 stretch from last August. That can’t happen again. Don’t worry about the collapses of 2011 and 2012. This is a different team. Things will be different. The names on the back of the jerseys and the faces in the dugout may have changed from last season, but this is still the same Tribe. Wednesday’s loss was the Tribe’s 12th in their past 16 games. It was also the Indians eighth consecutive road loss, a feat they last accomplished .. wait for it … last August during that 5-24 skid. And things don’t get any easier as they head to Detroit for a three-game weekend series with the Tigers then off to Texas for a series with the Rangers. The problem is there doesn’t seem to be much that Francona can do. With a couple of exceptions, most notably Jason Kipnis, no one on the Tribe is playing all that poorly. In fact, the everyday regulars are pretty much playing to their career averages – and therein lies the problem. Even though he has been slumping lately – a .173 average with 27 strikeouts in his past 23 games – Mark Reynolds is still batting .242 on the season, six points above his career average. Same goes with Nick Swisher. In the four full seasons when Swisher was not protected by a New York Yankee lineup, he has posted a .243 batting average, and averaged 25 home runs and 79 RBI. Project Swisher’s current production out over a full season, and he will wind up not far off those numbers with a .249 average, 22 home runs and 65 RBI. Pretty OK numbers if you are a complimentary player who bats seventh in the lineup, but not what one would expect from a player who signed the largest free agent contract in franchise history this past off-season. Look at the rest of the lineup and you’ll mostly find the same thing. The pitching staff is in pretty much the same situation, with the exception of relievers Vinnie Pestano and Chris Perez who have struggled this year (with Perez possibly taking it one toke over the line while on the disabled list, unless he really didn’t do anything), but everyone else has pretty much pitched as advertised. So what’s the team to do? 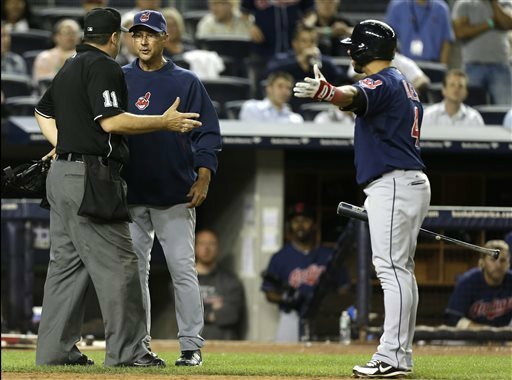 “We’ve played 20 games in a row, all sorts of hours, night games, day games … but this is what we’re paid to do and we need to find a way to go out and get it done,” Swisher told The Plain Dealer. The good news is the Tribe is currently just two games behind the Tigers in the AL Central. Take care of business this weekend and the past couple of weeks turn into just a bump in the road. But if the Tribe struggles? Well … everything was supposed to be different this year. The hot starts and collapses of 2011 and 2012 were supposed to be swept out of town with the old manager and the old players. But so far the new Tribe looks the same as the old Tribe. And that’s currently not a good thing.